“Resistance” might as well be the defining word of our decade. Public space, critical voices, and traditional and social media discourses have increasingly grown to accommodate various manifestations of resistance, in many formats and with many objects. Resistance overwrites existence: to simply be in our world today is to resist some form of violence, to stand strong in the face of subtle or overt abuse, and to block countless daily attacks to freedoms and rights. For some, existence has long been synonymous with resistance – their lives lived with joy and pride in the face of adversity and persecution. The European Roma are one of the groups whose history is laden with violence, yet their existence is marked by beauty, hope, and richness. Founders of the European Roma Institute for Arts and Culture during the launching event of the European Roma Institute for Arts and Culture. Berlin, June 8th, 2017. Pictured, from left to right, Nicolae Valeriu; Michael Roth, Minister of State for Europe at the Foreign Ministry of the Federal Republic of Germany; Timea Junghaus, Executive Director of ERIAC; George Soros, chair of the Open Society Foundations; Nicoleta Bitu, Member of the Board of the ERIAC; Thorbjørn Jagland, Secretary General of the Council of Europe and ; Željko Jovanović, chair of the board of ERIAC. © Gordon Welters/Laif for the Open Society Foundations. The newly-established European Roma Institute for Arts and Culture (ERIAC) acknowledges this form of resistance, less as stoicism, and more as a steady, purposeful fighting back. The institute aims to overturn current relationships between the culture, experience, and art of European Roma communities and their representations and discursive structure. The founders of ERIAC recognise a rift between the experiences of Roma and the voices that report on these experiences. For too long, the stories told of the Roma have been authored by non-Roma agents – the media, the mainstream art establishments, or political speech – and the damage has been significant. European Roma Institute for Arts and Culture Office and Art Space in Berlin. Pictured, artwork by Damian and Delaine Le Bas’s. © Nihad Nino Pušija/ ERIAC. Artwork of Sead Kazanxhiu, exhibited during the launching event of the European Roma Institute for Arts and Culture. Berlin, June 8th, 2017. © Gordon Welters/Laif for the Open Society Foundations. The institute targets fragments of colonial thinking and discriminatory practices that continue to destabilise the life and work of the Roma in European democracies, with a direct mission to “decolonise the knowledge of the Roma,” disrupt oppressive narratives, and “increase the self-esteem of Roma.” This mix of critique of systemic violence and structural racism, essentially looking at larger frames of political and social life, and the celebration of humanity, creativity, and individuality make ERIAC an incredibly powerful social and cultural agent. By crossing activism and academia, the institute lays a new ground which only strengthens the outcome of the two, as it imbues research and academic work with the immediacy of activism. European Roma Institute for Arts and Culture Office and Art Space in Berlin. Pictured, artwork by Alexander Schinkowski. © Nihad Nino Pušija/ ERIAC. European Roma Institute for Arts and Culture Office and Art Space in Berlin. Pictured, artwork by Damian Le Bas’s. © Nihad Nino Pušija/ ERIAC. The focus on intellectual emancipation elevates the battleground, and hits at the core of a biased status quo that maintains a hierarchy of access to debate and intellectual participation, one that would emphasise the marginal position of the Roma, rather than conceiving spaces of inclusion and openness. ERIAC exists to support the shift from a discourse on Roma as objects to one where Roma individuals and groups are the speaking subjects. In the face of increasing xenophobia and a worrying normalisation of hate speech, the institute seeks a redefining of the role and status of Roma art and creative voice. New violence is met with new instruments of resistance; the structure of ERIAC as a “creative hub” and a “public educator” points at a plurality of voice, a multitude of visions, and a diversity of viewpoints that make up the experience of European Roma, thus directly fighting cemented prejudice and reductive imagery and discourse surrounding the Roma. Concert of the Milan Kroka and Live Band featuring Pavlina Mtaiova, Marta Balazova and Jan Bendig, during ERIAC International Cultural Outreach Program event in Prague “Sar dičhola romaňi kultura dureder” – The Future of Romani Culture”. Divadlo Korunni, February 13th 2018. © Nihad Nino Pušija/ ERIAC. 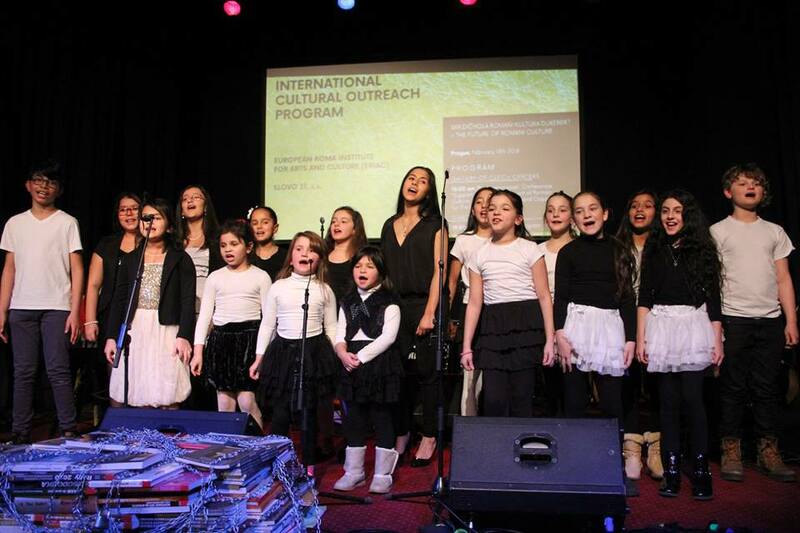 Concert of Children's Choir of Pavlina Matová and Marta Balázová during ERIAC International Cultural Outreach Program event in Prague “Sar dičhola romaňi kultura dureder” – The Future of Romani Culture”. Divadlo Korunni, February 13th 2018. © Nihad Nino Pušija/ ERIAC. One form of cultural violence aimed at European Roma is defined by the clash of visibility and invisibility – the tension between being ignored at the level of political representation and policy making, and being over-exposed, overburdened by makers of difference that inform exclusion. A way to settle this tension and navigate its implications is to recalibrate the visible – produce alternative narratives, tell different stories, engage other aesthetics. If current narratives of the European Roma often employ a language of exclusion and objectification, the new narratives are envisioned to seek empowerment through revised topical and aesthetic content; through a focus on potential and value, rather than loss and weakness. In this sense, ERIAC embraces a type of vitalism of the Roma arts and culture, rather than a perpetuation of a story of victimhood and fatalistic nostalgia. The beautiful and talented cast of the "Roma Armee" play at the Maxim Gorki Theatre, during the grand finale of ERIAC’s International Cultural Outreach Program. Berlin, 26th of February, 2018. © Nihad Nino Pušija/ ERIAC. 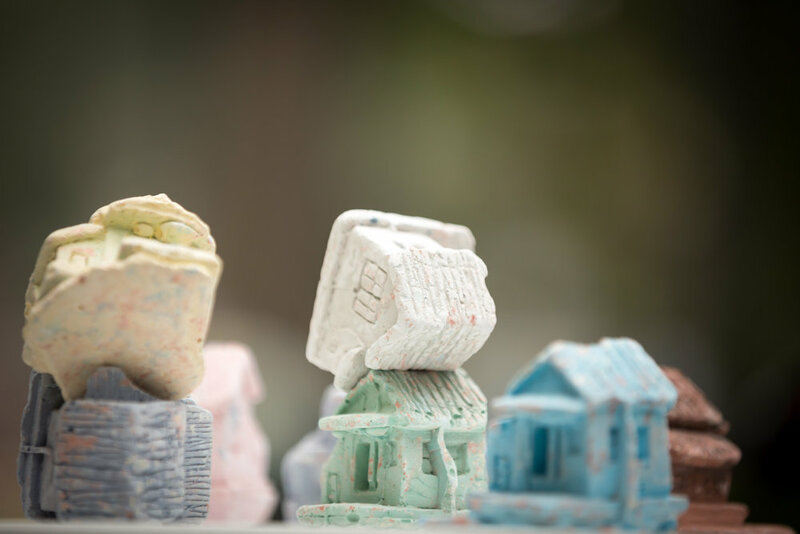 Shaped and circulated by Roma creatives and artists themselves, the stories of the European Roma have the potential to disrupt and replace objectifying and demeaning knowledge of the Roma. This self-knowing and self-determined form of expression promises to bring a discipline of language and discourse, a clarity of categories and definitions, and a more transparent and accurate telling of histories of the Roma. Nevertheless, the role of an organisation such as ERIAC is not without challenges: how to curate, visualise, aestheticise diversity, without the risk of it being exoticised, reduced to otherness? How to disseminate the results of intellectual work, to reach those who suffer most from discrimination and exclusion, and might be in fact excluded from these platforms of debate?